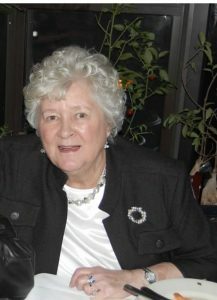 Rose E. (Fox) Stryke passed away at the Sawtelle Family Hospice Home, in Reading, late Tuesday evening, January 29th. The beloved wife of the late Roger C. Stryke, she was eighty six years of age. Born in Brighton, she was the daughter of the late Edward and Mary Fox. Rose was raised and educated in Charlestown, graduating from Charlestown High School along with the Class of 1950. Being one of seven children she was never without a playmate! Following high school she began working at John Hancock. It was there that she met the true love of her life, Roger Stryke. They married in 1952 and moved to California for , as Roger was serving in the military during the Korean War. The first of their four children was born in California and after their return home, three more children followed. Rose was a very dedicated wife and mother. The family loved the beach and went often and when that wasn’t possible they had a pool in the backyard that entertained family and friends for hours on end, year after year! Rose was quite a cook and her domestic capeabilities did not end there. Being a seamstress for her family was absolutely amazing. Dresses, gowns, buttons and hems, she could do it all and was always happy doing it! Travelling was always a favorite for she and Roger. They loved Bermuda and were there frequently! When they were not there, then they would be found enjoying themselves on cruises in the Carribean. As the grandchildren began arriving, “Nana” was thrilled. The pool in the back yard was always busy throughout the summer months, along with cook outs and family fun. On those rainy days she would always enjoy cuddling on the couch, watching TV with them or often times in the kitchen, teaching them all how to cook. Nana just loved spending time with her grandchildren, and later becoming “Nana Rose” to her great grandchildren. A very loving and compassionate woman, Rose so loved sharing time with her family. Her very kind and gentle ways always made Rose a very special lady. not just to her family but also her friends. I am very sorry to hear about your loss. Keeping the family in my thoughts and prayers. We are so very sorry for your loss. You’re in our thoughts.